None of the words people listed came as a surprise to me. Some were only mentioned by one or two people, and these included stamina, creativity/ingenuity, diplomacy, firmness, vision, kindness, empathy/compassion, routine, belief in yourself, prioritising (or as one mum wrote- 'don't sweat the small stuff'), and good research skills! There were two things mentioned by quite a few people. They were flexibility and staying positive. Not surprisingly, most of us listed some of the same things. Here are the top 5 things mentioned. In tied 4th and 5th place were acceptance and love. In 2nd place was the idea of being willing to stick with it. This was expressed in use of words like persistence, stubbornness, dedication and determination. In 1st place was PATIENCE! I suspect if there was no limit on the number of words to be listed we would have all included all these things in our lists. They are certainly all skills I use daily with my kids. Patience is my number one because there is not an hour goes by when I don't need it! There are only so many times you can manage to hold it together through tantrums about which way the toilet paper is folded or the shape the sandwich was cut into, and only so many days you can listen to interesting facts about Chilean Rose Tarantulas and their moulting process for hours on end without feeling like tearing your ears off your head. As endearing as it is to have your 5 year old say the word banana over and over and over and over and over again, when it is still happening when he is 12 it does wear a bit thin. Having to go through the same long and tedious bedtime routine (that requires your physical presence and willingness to be touched- grabbed, held on to, squeezed- no matter how long or emotionally exhausting your day has been or how badly you just. need. to. be. alone.) every night is irritating at best and downright infuriating on some nights. Whoever first said "patience is a virtue" may well have had an Autistic child!! "If at first you don't succeed, try, try again" Yep! This is true on so many levels. For our ASD kids it is how they learn pretty much everything! I've mentioned before that they learn social conventions by rote. L has learned spelling and grammar vey slowly (so many of our rules in English are broken so often!). G still has trouble with toileting at almost 5 years old. It took G until she was 4 to understand that someone walking past your game does not indicate their intention to disturb it. These are only a few examples of how important persistence is to our kids. If I am going to support them through all their efforts, persistence is more important for me. I need to be their rock and encourager when they have had enough and can't cope anymore. I need to be the one who stands beside them and says- "I know it is hard. I know you are tired. I know it feels like you will never get this. But, you know what? I believe in you. I'll stand here with you and help you. You can try again. I'm here, cheering for you, because I know you can do this. Have another go. It will be alright." If I persist, they will too. And we learn together how to get the hard things done. A person with an ASD relies heavily on routine to get through their day. Unexpected things can really throw a spanner in the works for them. Any unexpected or unpredicted event or sensory experience can set them off into a meltdown. It can be as simple as a bump on the elbow. As a parent dealing with the need for routine requires as much flexibility as dealing with the effects of an interruption to the routine. A simple example is that I like to be able to walk the kids to school in the morning. It's good to get some exercise and use the car less. It's only a 1km walk down the road, so it's not tricky once we leave the house. But on a morning when G has woken "on the wrong side of the bed" we often just can't be ready in time to walk, because she will not be able to eat breakfast in good time, or not be able to find the right clothes to wear, or just simply not want to walk. Me imposing my idea of a good timeline on those days would cause her serious distress as she tries to gain control over her sensory system. For me, learning to be flexible with my plans allows G the room and safe space she needs to sort through the situation herself. The more times I am able to give this to her the better she is becoming at dealing with her challenges, and the less often I find I am in a position where I have to seriously change my plans. It doesn't hurt me to be flexible, we can drive to school if we need to. We can be late to school if necessary. Me being flexible empowers her to learn the skills she will need later in life when she needs to handle things without my support. It also gives all my children the gift of a less stressed mother, who is not always rushing and scolding and insisting. "Laughter is the best medicine". "If you don't laugh, you'll cry". Those may be true, but my favourite laugh quote is Mark Twains " The human race has only one really effective weapon and that is laughter". Having a good sense of humour is essential when you are living with an Autistic child. It is good to be able to laugh together about things. Sometimes a laugh over a little misunderstanding is helpful. It is also helpful to be able to laugh quietly on your own about some things too. Sometimes ASD kids can say the most embarrassing things, very loudly, in public! One of my favourite blogs at the moment is just a collection of funny stories about the authors ASD kids and the things they say and get up to. A slight misunderstanding of a phrase, a nonsense joke told in monotone, a quirky behaviour, nakedness at inappropriate times....! And it doesn't just have to be laughter at the things that are funny. It is also important that we recognise the funny and fun things, the positives, about ASDs. There are just as many of them as there are tricky things. It can be laughing with joy- the joy found in the little things. Yesterday G came away from preschool full of joy and laughter at having found a frog in the garden that no one else knew was there until she caught it in her hands and presented it to her teacher!!! "It was a BIG surprise and we got a container with a lid with holes and we put it in and watched it and mum it got away and jumped back to its family", her words ran over themselves and she was so excited to have shared this find with her teacher who happily shared the experience and supported G in her desire to look after this unexpected visitor. Joy! This one might sound odd, but it is important to me. 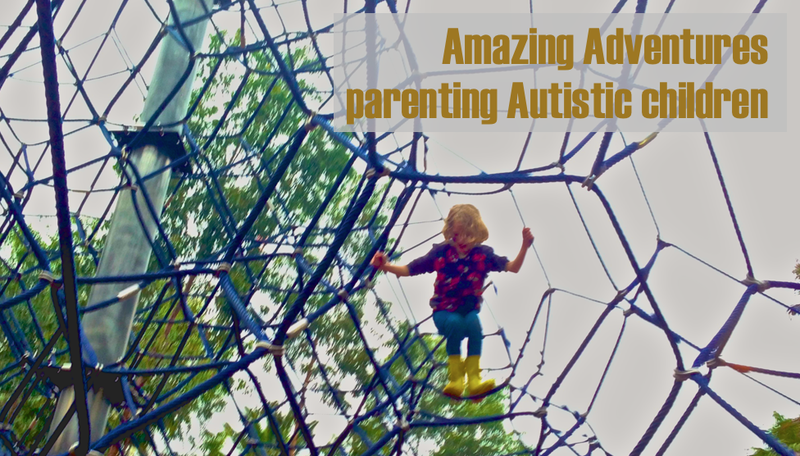 It is easy sometimes to get stuck thinking about all the hard stuff about parenting an ASD kid. It is easy to feel overwhelmed, tired, and just plain out of sorts. A wise lady once said to me sometimes you need to ignore the "shoulds". She was referring to all the things we should be doing (for instance, right now I *should* be getting some washing done!). She told me that after 50-some years of taking care of the shoulds that she wishes she had taken more time to do a few things she had wanted to do because then she would have been better able to enjoy her children's growing up years. She was telling me to take care of my needs as a priority act of parenting. So my "selfish" desires to read a book, or go out window shopping with a girl friend, or spend some time alone with my Wonderful Hubby are now things I listen to. Of course I can't always drop everything and go off to the shops, but being aware of what I want and making time to do it sometimes helps me take care of myself and enables me to recharge my energy reserves and be more present for my kids when I am with them. Knowing that I have some self care time coming up helps me be patient, persistent, flexible and humorous when things are tough. This wonderful lady gave me this advise when my 3 oldest children were very young, and well before our journey into the world of Autism had begun. I have been grateful for her wisdom and the gentle way she shared it many times since! So, there are my top five. I welcome your thoughts and comments on this topic. If there is something you use everyday, a skill or personality trait that is invaluable to you in raising your children, please share it with me by leaving comment below (or on the Facebook page). We can all learn from each other in this area and hearing from others is a great support when we can often feel so isolated. I love your positivity Michelle! You're right; it is so easy to slip into feeling tired, overwhelmed and out-of-sorts as a parent of ASD kids. Thanks for reminding us of all the beautiful moments. Thanks for you r comment Narrell. Being positive IS so important isn't it? Maybe I should have done a top 6 list and included it!! :-) I just hope that on my down days there will be people around who are willing to remind me of all the positives!